This intriguing programme opens with Cypriot composer Andreas Moustoukis’s work Octana, based on Andreas Empirikos’s surrealist poem by the same title. 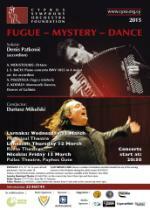 This is followed by a rare opportunity to enjoy the accordion performing one of J. S. Bach’s most fascinating harpsichord concertos and Piazzolla’s passionate tango “Fuga y Misterio” from his tango-opera Maria de Buenos Aires. Τhe intense tango pulse and atmosphere of this work is illuminatingly juxtaposed to the somber colours, improvisatory clarinet passages and exhilarating rhythms in Kodály’s symphonic expression of folk dances from Galanta and Marosszék.